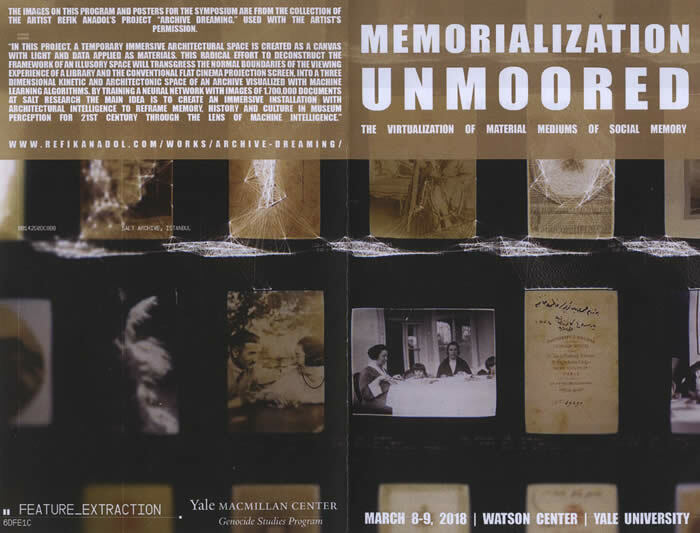 "Memorialization Unmoored" symposium at Yale Genocide Studies Program on "The Virtualization of Material Mediums of Social Memory"
Barcellini is now Président Général du Souvenir Français and Contrôleur Géneral des Armées, and visits to curators of sites of memory in France were included to bring the presentation up to the minute. 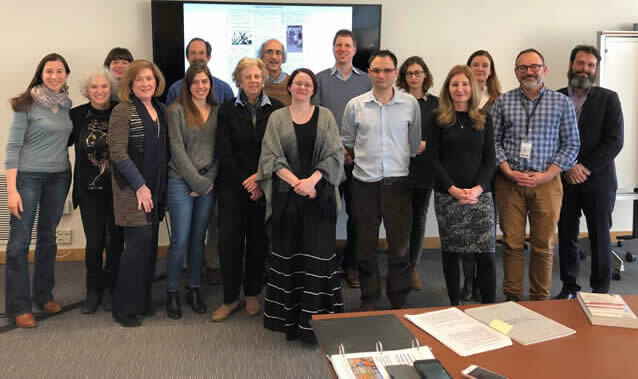 Group photo of syposium presenters was taken in front of page from this website and includes the book edited by Wieviorka and documentation of the March ,1 2018 European Union declaration of Natzweiler-Struthof as a European heritage site. Thank you, David Simon, Director, for this exciting, inspirational program, Eve Zucker, and Taylor Krauss for this great photo! 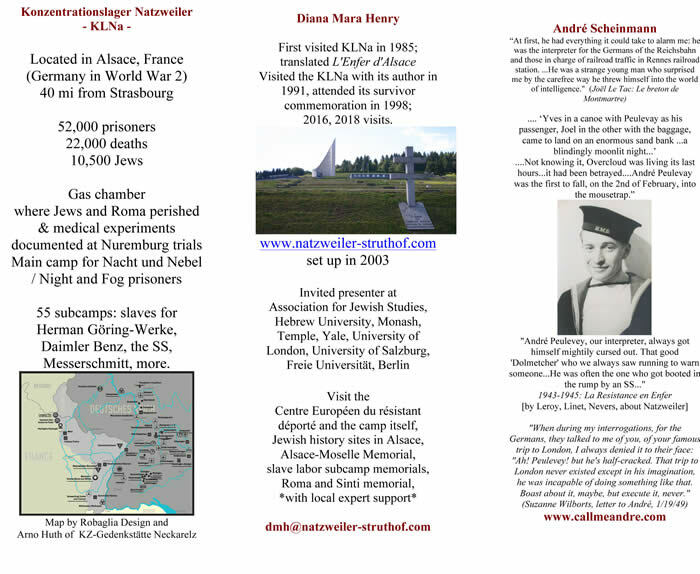 The website that follows represents my research since 1985 of Natzweiler-Struthof, "Le Struthof" as it is called in France and Konzentrationslager Natzweiler/ KLNa by the Nazis, who created it on Alsatian soil as soon as that region was taken in 1940 to be administered as Germany, not occupied or Vichy France. I was prepared to undertake this second career by undergraduate studies at Harvard (Radcliffe Class of '69) that included a graduate seminar about European Fascism taught by Charles S. Maier, currently Leverett Saltonstall Professor of History at Harvard Universit for whom I wrote a paper entitled "How Hitler slipped through the crack in History." The Ferguson History Prize for the sophomore essay in History was an honor I received for "The Concept of Time and History" before switching to Government major, for which I got my A.B. as Harvard terms the BA degree on its diplomas. Brought up by a Frenchwoman at home while my parents worked, I became fluent in French from age 2. At age 11, I entered the Lycée Français de NY where I followed the "Classique" course of study including six years of Latin and four years of Greek, winning top honors ("Prix d'Excellence") for four of the six years and Prix d'Honneur the last year. My fellow students honored me by voting me Class President for four years in a row. I began to teach French for the first time at the 300-level at the Monterey Institute for International Studies, where I also designed courses of individual study and taught in the Custom Language Institute in 1994-1995. Evaluated at native level proficiency, in 1995-1996 I became Assistant Professor of French at the Defense Language Institute, team-teaching two six-month cycles of immersion French for members of the Armed Forces. After relocating back to the East Coast, I taught Internediate French Language and Culture at Brandeis in 1998 and at Trinity College in Hartford in 2007 and 2009, among many other college teaching assignments for French. "Vanishing Jews of Alsace and the Natzweiler-Struthof Concentration Camp," an exhibit presented at the Carl Cherry Center for the Arts in Carmel, CA in 1990 incorporated my photographs of both the camp and the sad remnants of the Jewish community that had flourished in Alsace for hundreds of years before the Nazis overturned it. 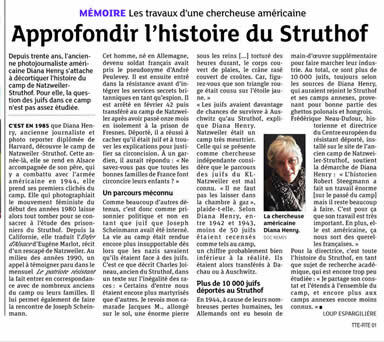 A couple of family members, who had been in the Maquis, or run away from the Gestapo, survived A French Tragedy as Tzvetan Todorov called his book about the events of August, 1944, in Guerry. There, four other members of my family and dozens of other Jews who had lived in peace through the war were massacred by the French fascist Milice in a last-minute skirmish of the civil war that had been roiling in France under the Nazi boot. With these new acquaintances and to communicate this new knowledge acquired from a trip to Alsace in 1985, the 1991 exhibit was created with the text of Eugène Marlot's book, l'Enfer d'Alsace, translated by Diana Mara Henry and read, page by page, by 60 citizens, old, young, male and female, of Carmel, CA. Marlot's text in my translation also hung on the wall in perforated computer printouts, between the photographs, creating a complement to the voice recordings. When contacted about the exhibit, Marlot reached out wth an invitation to come to stay with him in Dijon and visit the camp on tour he was leading for students and teachers of the Concours de la Résistance et de la Déportation. Marlot, ever the communicator - his role in the Resistance had included printing an underground newspaper, "L'espoir," madesure to have a newspaper journalist there in Dijon to record the visit of l' "Américaine, qui de sa lointaine Californie a bien voulu s'interesser a mon modeste ouvrage, et surtout, au vaste problème qu'il pose… " (the American woman, who, from her far-distant California, was willing to take an interest in my modest work and especially in the vast question it asks…) See page for him from the main page of this web site. Marlot took me to visit also the prison he had been taken to, "I was arrested by French police, taken to a French prison, shipped out to Germany on French trains" - his experience and my relatives' pretty much parallel up to the point where my relatives Mina and Solomon and Gédéon and Adolphe were shot and thrown down a well. I photographed the monument he created in Dijon, an obelisk of stones carved at Natzweiler. We stayed in touch, and he sent me The Struthof Album that the Klarsfelds had composed of Nuremburg trial documents about the gassing of the Jews at Natzweiler - again with an inscription: "Offered by Eugène Marlot to Madame Diana Henry because of the interest she takes in the great event of the 20th century- Nazi Barbarism." He also shared with me some of survivor Henri Gayot's awe-inspiring drawings of the KLNa. On that same visit in 1991, I was able to visit and study at the the great 20-room Musée de la Résistance et de la Déportation in Besançon, and to collect dozens of manuscripts, already then - and now even more - rare, of survivor memoirs, which gave a start to what is perhaps the best private collection of documents in private hands of the Natzweiler camp's survivor testimony. Returning to Harvard for my 25th reunion, I met a classmate, Michel Scheinmann, for the first time and he introduced me to his father, who had been, as he said, a "camper at Natzweiler." André, born Joseph Scheinmann, whose name was later changed to Andre´ Peulevey when he enlisted in the French army, thus giving him a true "nom de guerre," became my guiding star from 1994 until his death in 2001. I moved back to the East to undertake French Literary Studies and Translation at Brandeis, my Master's thesis a revision of l' Enfer d'Alsace under the guidance of Professor Jane Hale. It was in proximity to André that I began the edit of his memoirs, now known as Call Me André: Freedom Fighter and Spy for the Resistance, which is being readied for publication. Concurrently and continuously, I read, collected memoirs, studied and translated all I could find on the KLNa. 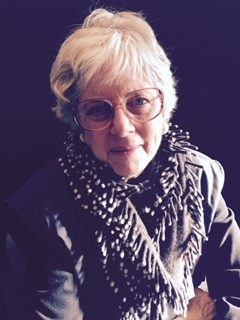 Konnilyn Feig called me "the world expert" on Natzweiler; meetings and correspondence with Martin Gilbert, Sister Rose Thiering, Steve Draisin, and many other inspiring personalities in the field of Holocaust memory have inspired and encouraged me along the way. 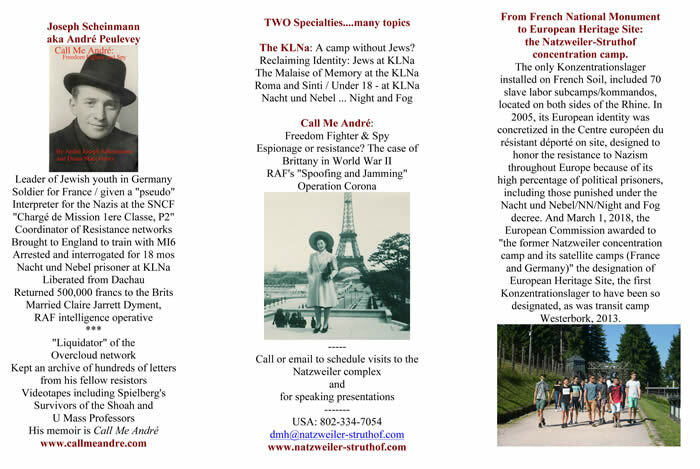 I created a website for the camp, online at www.natzweiler-struthof.com and eventually www.callmeandre.com. Not a week goes by when a relative of a survivor - even children of the guards - have written to me seeking and sharing information about their relatives. I established pages of commemoration for those who wanted me to, with letters, writings, and biographical information about their role in the resistance in Luxembourg, Slovenia, Poland. Most significantly, I continued to meet and or correspond with dozens of survivors of the camp or its Kommandos/satellite camps including Joseph Linden, Oscar Klausenstock, Arne Brun Lie, Henri Rosencher ("Breuillot" in the camps). Roger Cornet, Georges Maradène, Max Nevers, Charles Joineau, up to this past year, Roger Monty. Many of these survivors were introduced to me upon attending the 1998 commemoration ceremonies at the camp, where I met Max Marlot who was there to scatter his father's ashes on the camp after Marlot, who used to say "Je suis né avec le siècle" ( I was born with the century-1898) died that year. Special interests, research and writing concern the NN/Nacht und Nebel/Night and Fog decree; the 70 kommandos provisioned by the SS with slave labor from the KLNa; and the order of October 5, 1942 issued over Gerhard Maurer's signature from Oranienburg, to rid all the major German concentration camps of Jews and send them to the killing centers of Auschwitz and Lublin. These little-known aspects of the concentration camp history as well as the almost total ignorance of the Natzweiler camp itself, continue to haunt and challenge me. 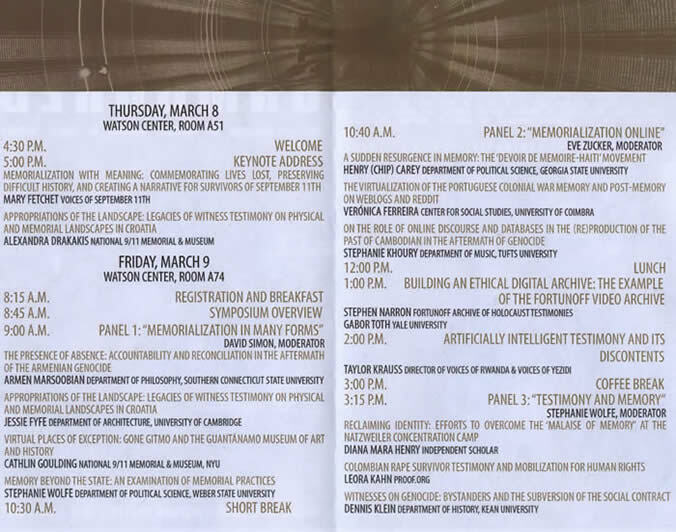 and on the topic of "Children at the KLNa" for the conference on Children and War: Past and Present, held at the University of Salzburg, Austria, 2016. 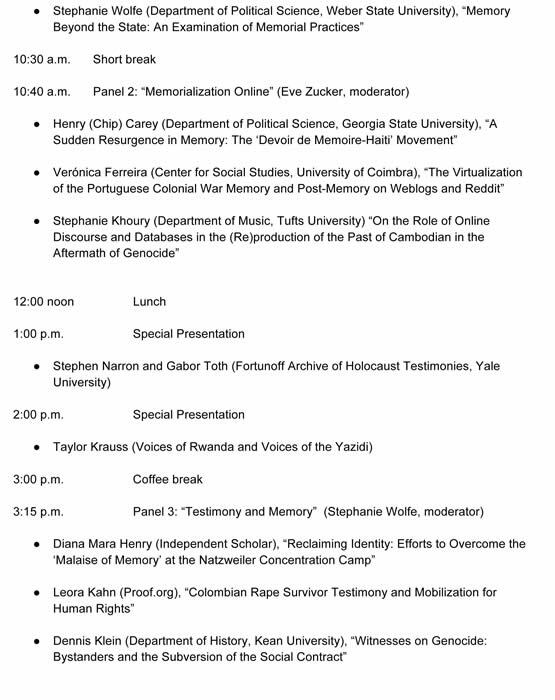 In January 2018, at the sixth international conference on ‘Beyond Camps and forced labour: Current international research on survivors of Nazi persecution’,to be held at Birkbeck, University of London, and the Wiener Library, London, Diana Mara Henry has been invited to present on "Prefaces, Dedications and Conclusions" of the survivor memoirs of the KLNa. Special Collections to archive the interviews, documents and research materials have been created in the name of Diana Mara Henry and André Joseph Scheinmann at the University of Massachsetts, Amherst, the US Holocaust Memorial Museum, Washington, DC and Beit Lohamei HaGetaot/Ghetto Fighters' House Museum; the memoirs of André Joseph Scheinmann in manuscript form have been purchased by the Juedisches Museum, Muenchen; the Wiener Library, London; and are in the collections of the Memorial de la Shoah and Yad Vashem in digital form. Diana Mara Henry's photographs of Eugène Marlot and other aspects of her research have been incrorporated into the educational materials, programs, and website of the Centre Européen du Résistant Déporté, on site at the camp and online. 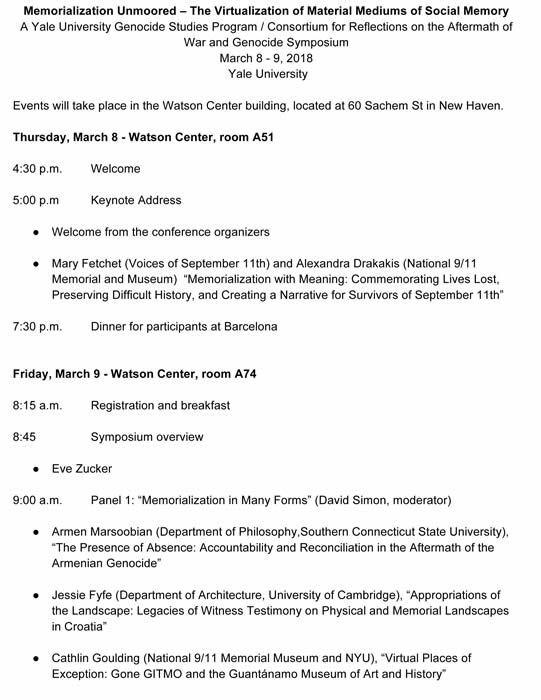 Invited to speak to audiences as diverse as The French Library and Cultural Center, Harvard Hillel, Trinity College and Brandeis, delivering Yom Ha Shoah keynotes at New Bedford and Springfield College, and in synagogues, fraternal organizations, and library settings,Diana Mara Henry has undertaken and continues the endless, and endlessly inspiring task, of honoring the memory of those who suffered and died on that mountain of howling horror that was the KLNa. It is arduous and especially lonely to be an independent scholar and this field of study does not abound in joy. Your support and encouragement are all the more meaningful. Thank you.